For the past seven years, Tawny Galles has wanted a book-sharing box in her yard. For those who know her, it’s no surprise — she loves books, she loves kids, she loves sharing and she loves cute things. Combine all of those and you get a little, free library. But life and a lack of wood construction tools and know-how kept it from happening. 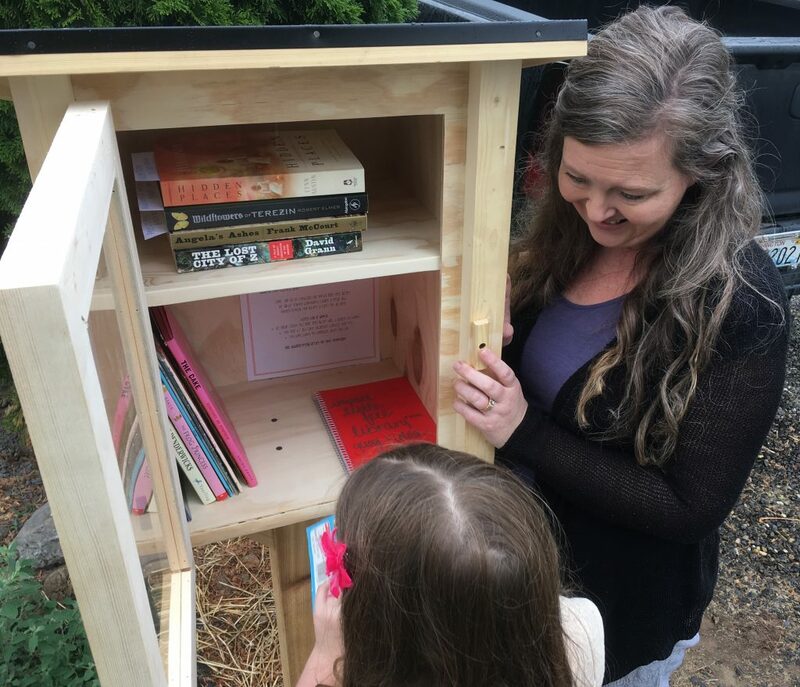 Two weeks ago, a pre-constructed neighborhood sharing library from Little Free Library arrived on her doorstep and by the end of the day, it was standing on a post in her front yard in the Clarkston Heights. Galles received her library through the Impact Library Program with Little Free Library, which fosters neighborhood book exchanges around the world. The Impact Library Program provides book-sharing boxes free of charge in places where they are believed to make a difference in motivating readers and connecting the community through books. Anyone can put up a Little Free Library, though those who wish to be associated with the organization must pay a one-time $40 fee. This registration provides them with a charter number and puts them on the Little Free Library map. People can build their own boxes using any number of materials or they can buy one at the Little Free Library website. Those sold on the website come in a variety of styles and finishes and have the charter number and fee included. They cost anywhere from $149 for a small box, generally used as a “library addition,” to $2,500 for a adult-height book sharing “pole.” The standard unfinished two-shelf library is $299. Galles first noticed book sharing libraries on the western side of Washington state where she grew up — some neighborhoods over there are filled with them, she said. But because of the price on the official website, a pre-constructed library box wasn’t an option, so she pursued other ideas. “I was desperate enough that I wondered if maybe I could build this thing,” Galles said. 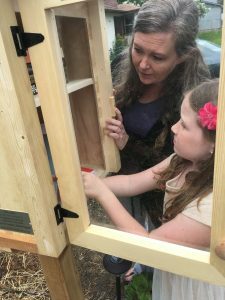 She was looking online for simple designs when she found the Impact Library Program on the Little Free Library website. Galles applied for the program in April, citing local income levels and her proximity to schools as reasons a book-sharing box might have community value in her yard. Her application was approved and the library arrived less than two months later, along with a mounting pole, a number of books and tips on running a successful library. Participation in the program comes with obligations, including one to talk to local media who inquire about it. Galles — who will manage the box with the help of her four kids — also has to keep the box stocked with books for a minimum of one year and must host a neighborhood activity. The library will be painted and decorated in time — for now, at least it’s up and there are books inside waiting for new owners. Galles doesn’t know what to expect but she’s hoping the library fosters interaction in the neighborhood and that it will get kids excited to read. And, she added with a laugh, she’s selfishly hoping to enjoy a few new books herself.